Welcome to Wishing Well Historical Cottage! This circa 1871 historic summer cottage is owned by Canadian Soprano Maria Rekrut. The 'Museum within a Cottage' is filled with a private art collection, antiques and collectibles. This unique, adult-oriented cottage provides all the home comforts you'll need on your trip including a feather down mattress, duvet and pillow, fluffy bath robes and hair dryer. All you have to bring is your toothbrush! This cottage boasts colour digital cable TV, VCR, clock radio and fireplace in an air-conditioned and air-purified environment. Relax on the patio or deck, surrounding yourself with the tranquility of our unique organic Victorian garden. A barbeque is available for your convenience. This historic property still has all the original pine floors, windows and doors. As you can imagine, 130 year old pine floors are especially delicate. We require that shoes be removed upon entering the cottage and we provide slippers for your comfort. 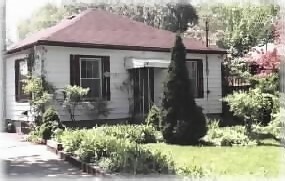 The Wishing Well Historical Cottage is open all year and is great for a summer retreat or winter getaway destination. When you stay here, you'll be just minutes away from the Old Town section of Niagara-on-the-Lake and all the shopping, dining and theatre experiences Niagara-on-the-Lake has to offer. 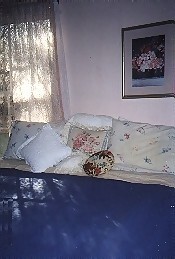 The cottage features two suites. The Mistress Soprano Suite (above) is highlighted by a high, four poster Queen bed. The Mistress Soprano Suite also includes a fireplace, colour cable digital TV, radio and an ensuite bathroom. 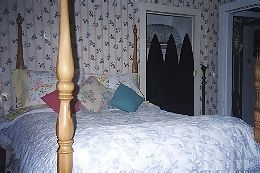 The MASTER TENOR SUITE (left) features a four poster King size bed, cable TV and VCR and radio. There is a private bathroom. Sign up to receive Niagara B&B promotions via e-mail!